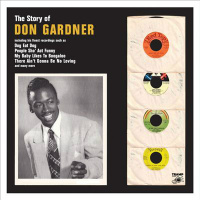 Rating: The story of Tramp Records’ most excellent The Story Of… series continues with the tale of rnb, funk, soul and jazz drummer and vocalist Don Gardner. Hmmm – the name rings a bell – 1962 cut I Need Your Lovin’ perhaps – done as a duet with Dee Dee Ford? Yep – that Don Gardner. And while that track is not on this compilation, Tramp compiler Tobias Kirmayer has assembled a super tight collection that provides nuggets that are equally as good and, as indicated above, not just from the rnb genre either. Don’s more than two decade career, which this LP picks up on in the early to mid sixties and (in common with much of The Story Of… series) winds down in the early seventies (in Don’s case when he switched from music to the construction career and helped remodel the abode of one Curtis Mayfield), also covers soul-jazz and funk.